Clearly, it is important to see be able to see clearly in the kitchen when handling hot objects and sharp implements. For a start there are the Chefspecs Reading Glasses With Case . The cheaters come in a range of magnification, from +1.25 to +3.00, and make it easy to read recipes, deal with gadgets or just look stylish while cooking. 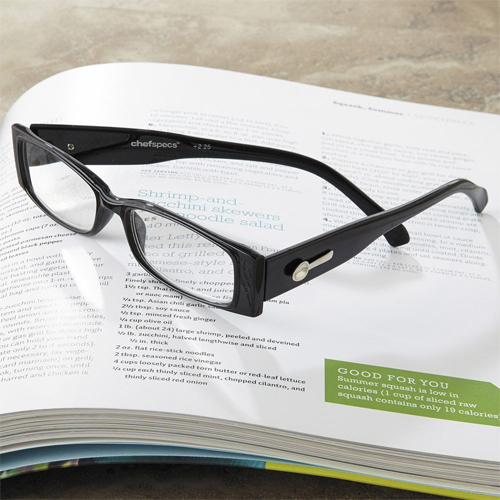 The reading glasses come with a magnetic case that can be attached to the fridge for easy access. That little spoon logo on the side of the glasses is pretty sharp too. And speaking of clearly, the glasses come with an anti-fog cleaning gel and cloth.